LOLOL! Yeah! Too bad I don’t remember a lot of the details XD My family always says that there was a super scary storm one day when we were driving, but thankfully I slept through the whole thing! LOL! Aw, you were so cute! 😀 I would love to visit the Grand Canyon someday. Great photo! Looks like a great vacation. The Grand Canyon looks so pretty! I haven’t been there yet but I hope to someday! 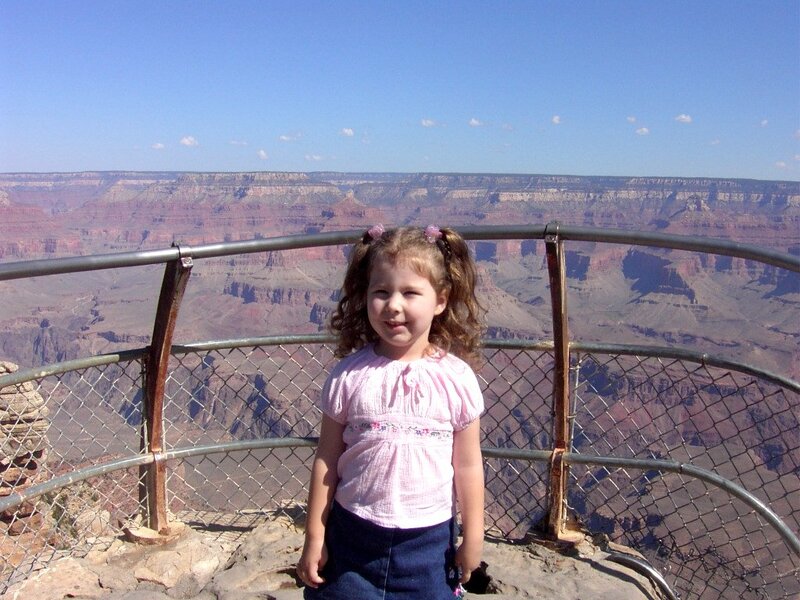 I went to the Grand Canyon when I was 4, and went to Meteor Crater among lots of other things this summer. We’ll be doing Grand Canyon for Spring Break or something like that. I know, right? It’s been so hot! I want rain!!! Oh my gosh! That’s so funny that we were the same age! I hope you remember the Grand Canyon better than I do LOL! Oh my gosh Jaclynn! That is an adorable picture of you! Love your “foofy” (credit goes to Emma for that word, lol!!) pigtails! Your hair is so pretty, then and now! wow! i really want to go to the grand canyon sometime. oh my gosh!!!!!!!!!! you are so cute!!!!!!!!!!!!!!!!!!!!!!!!!!!!!!!!!!! Aw. 🙂 you were pretty cute when you were little! The grand cAnyon sounds pretty cool, you should try to go back there sometime. You were so cute and pretty when you were little! You still are! I have never been to the Grand Canyon, but did go to the Smoky Mountains. I remember lots of turkies, moose?, and a little bear! Awww, look at you! So cute!